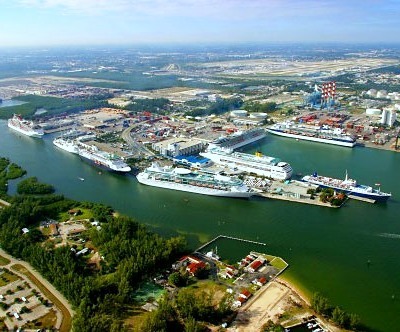 When one thinks about a Caribbean or a Bahamas cruise, it is usually assumed that Miami is the departure point, but the northern suburb of Fort Lauderdale has its own modern port facility and has rapidly become a favored jumping off point for ships taking vacationers to exciting tropical destinations. And the beaches, nightlife and colorful restaurants in this city are enough to keep everyone occupied and happy both before and after the cruise itself. 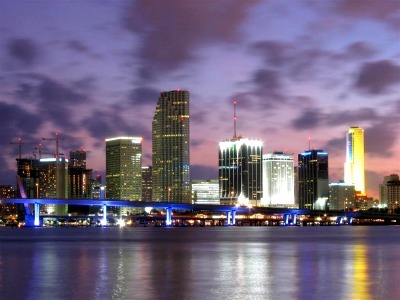 A nice mix of South Florida bustle and quieter southern atmosphere is a good way to describe this vibrant city. Its 23-mile stretch of white sand beach is as inviting as any to be found elsewhere. Vacationers departing from Fort Lauderdale embark at the modern, full service facility at Port Everglades. Only a ten minute taxi ride from both downtown and the Fort Lauderdale International Airport, the dock areas have a number of visitor information centers, vending machines and ATMs, as well as a small number of kiosks stuffed with see-and-do brochures and restaurant advertisements. The complex is also the busiest section of the commercial dock area and there is plenty of security around to make sure passengers are guided to the area where the cruise ships anchor. Most departures are at the Midport and Northport areas of the terminal facility. First of all it is imperative to get away from the dock area, which is heavily congested and offering little in the way of entertainment. The sand beaches of town are the favorite draw, and although they have been immortalized as the popular spring break destination for college students, they are actually quite clean, family-friendly and have undergone some major renovations in the past few years. New lighting for nighttime beach activities, landscaping improvements and the addition of many new shops and restaurants along the waterfront has completely transformed this glorious stretch of coastline. A great walking tour of the city would not be complete without a stroll along the Intercoastal Waterway, running directly through the city center. Downtown has a new flavor with the cropping up of boutiques, antique shops and upscale restaurants. One of those restaurants is the Mangoes on E. Las Olas Blvd. - a traditional Miami restaurant in its design as well as in its offerings that center around combination lunch and dinner plates including both steak and seafood. Another favorite is the 15 Street Fisheries, located naturally on 15th Street and considered the finest chowder house in the area. 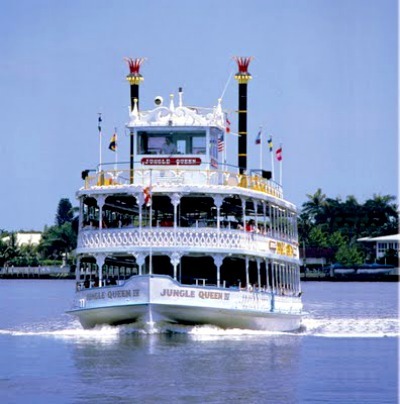 Those who want a bit more exotic experience can try the famous Jungle Queen Riverboat. It has drawn visitors for six decades and takes visitors on an inland sightseeing cruise as well as offering nighttime dining on board. Those who have come with families can try two and a half mile boardwalk on Hollywood Beach, known for its low-key atmosphere and street performers. Aside from the local favorites already mentioned, there are a number of smaller establishments along the waterfront that offer everything from pizza to seafood stews and hot dogs. La Bonne Crepes on Las Olas Blvd has a yummy breakfast of waffles, French toast and mouthwatering crepes. The H2O Cafe on South Fort Lauderdale Beach Blvd is famous for its Italian cuisine and serves up pasta, chicken and barbeque beef with a Cuban influence. Its outdoor seating area is in full view of the beach activities and is perfect for an evening meal while exploring the waterfront. Most of the cruise lines will have shuttle service to and from downtown for their passengers regardless of whether they have confirmed reservations at one of the local hotels. For vacationers arriving at the airport there is a free shuttle to Port Everglades itself, and rental cars can be booked ahead of time and picked up either at the airport or in downtown. Internet cafes are numerous throughout downtown Fort Lauderdale and of course there is Internet connection and WiFi at the airport. Although there are a number of banks that can exchange U.S. dollars for foreign currencies, it is best to wait until arriving at individual Caribbean ports, as many of these destinations will be full of merchants accepting American money, thus helping to save tremendously on exchange fees. Port Everglades sees many cruise ship departures and arrivals every day. The famous 23-mile white sand beach of Fort Lauderdale. 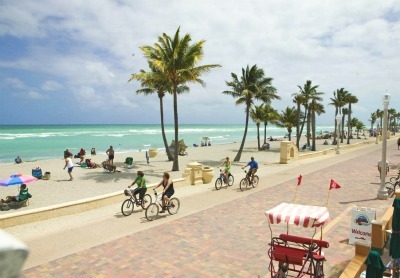 The Hollywood Beach boardwalk - a favorite place for both locals and tourists.